If interested, please send your name, contact information, and a brief summary of your work on Colorado River issues and water management solutions by April 19th, 2019 to brent.newman@state.co.us. The Jefferson Conservation District has a job opening for an Urban Agriculture and Noxious Weed Coordinator. The position is non-exempt, full-time (40 hours per week). The position is located in Lakewood, Colorado. The position is open until filled. Application review will begin on after April 21st, 2019. Click HERE for the full job announcement and information on applying for the job. The Jefferson Conservation District has a job opening for a Conservation Forester. The position is non-exempt, full-time (40 hours per week). The position is located in Lakewood, Colorado. The position is open until filled. Application review will begin on after April 21st, 2019. Click HERE for the full job announcement and information on applying for the job. Boulder County Parks and Open Space is seeking to fill two full-time, permanent, benefited Resource Specialists positions within our Plant Ecology Group. This is your chance to work with a progressive, land management agency based in Longmont, Colorado, that manages over 65,000 acres of open space. Applications close April 23rd. For full details and to apply, visit the job posting linked HERE. The Fort Collins Natural Areas Department has posted an awesome employment opportunity for a Senior Supervisor & Project Manager. This senior level, supervisory position is responsible for all strategic, management, restoration, and recreation planning. In addition, special projects are managed by, or under the direction of, this position. Success in this position will require the ability to collaborate deeply with internal and external partners. A high level of expertise and experience is required in natural resource management, biological restoration, and Western water law and administration. The candidate must have a history of successfully leading and managing teams, individuals, and projects. The application deadline is April 26th. The job posting can be found HERE. The Southwestern Water Conservation District is seeking candidates for the position of Executive Director. The District was created by Colorado statute in 1941 to promote the conservation, use and development of the water of the San Juan and Dolores River basins in Southwestern Colorado. The Executive Director works collaboratively to bring together groups of diverse interests on complicated matters. Applications are due on Wednesday, May 22, 2019 at 5:00 p.m. The job description and required application materials can be obtained from the District HERE. River Network is hiring a full time Marketing and Communications Manager. This position will be responsible for maintaining River Network’s inclusive and diverse visual identity, expanding our brand identity, integrating our program work into regular outreach and marketing, overseeing the content management for and production of a number of our regular publications, and promoting our learning opportunities for greater reach and influence. Position will remain open until filled with expectation of a May or June start date. For more information and how to apply head HERE. The WCCC BLM Internship Program is a unique opportunity to work directly with the Bureau of Land Management. 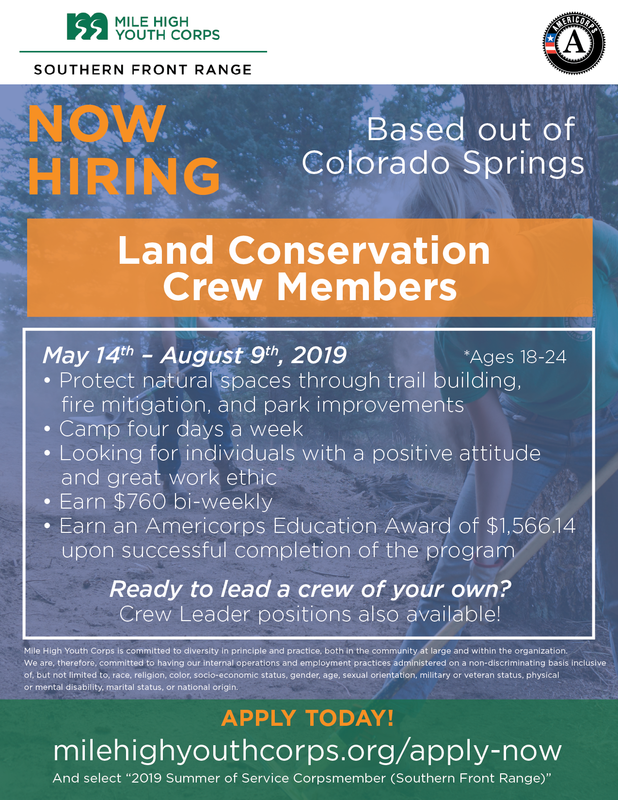 The WCCC has opportunities to serve directly with the Bureau of Land Management (BLM), through the Colorado Youth Corps Association (CYCA) and other assistance agreements. Positions range from hydrology work, cadastral surveying, travel management, botany and others. Positions are available throughout the state of Colorado. For more information, click HERE.